An Ammonia Leak at a Boston-based fish and seafood distributor, Stavis Seafoods lead to the death of an employee. The United States Department of Labor’s U.S. Department of Labor’s Occupational Safety and Health Administration recently conducted an investigation of the incident involving Brian Caron, an employee at the Stavis Seafoods Braintree facility, who was overcome by a fatal-level of ammonia, due to a leak. An inoperable ammonia-sensor alarm in the machine room of the Stavis facility was also uncovered. The OSHA investigation showed that a burst pipe caused the ammonia leak and that several employees, besides Caron, were exposed to dangerous levels of the ammonia vapor. The proposed penalty for the citation, which yielded 20 separate violations, is, $173,168. Industries which incorporate combustible or potentially fatal chemicals are inherently dangerous. 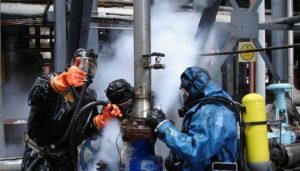 One way to combat the potentialities which may occur in such a workspace is to utilize every resource which may promote or ensure compliance, especially as regards confined space and the handling of potentially dangerous chemicals. There are many OSHA-approved training courses which provide instruction for safety leaders and employees, to this end.